We spent the fourth day (Thursday, January 14th) of our Florida vacation at Epcot. Epcot is divided into two parts: Future World and World Showcase. As I mentioned in an earlier post, I will be sharing with you our visit at World Showcase over the next several days. Earlier I shared with you our visit to Canada, the United Kingdom, France, Morocco, Japan and the American Adventure. This blog post contains photographs from our visit to Italy. Perhaps I should have been looking the other way and taking a picture of whatever the man was photographing. This woman’s hat caught my attention. I didn’t even notice her expression or the photographer in the background until I uploaded the picture to my computer. Note the two columns. On top of the right column is St. Mark the Evangelist. On top of the left column is the lion that is the saint’s companion and Venice’s guardian. I retrieved a photograph from my archives. 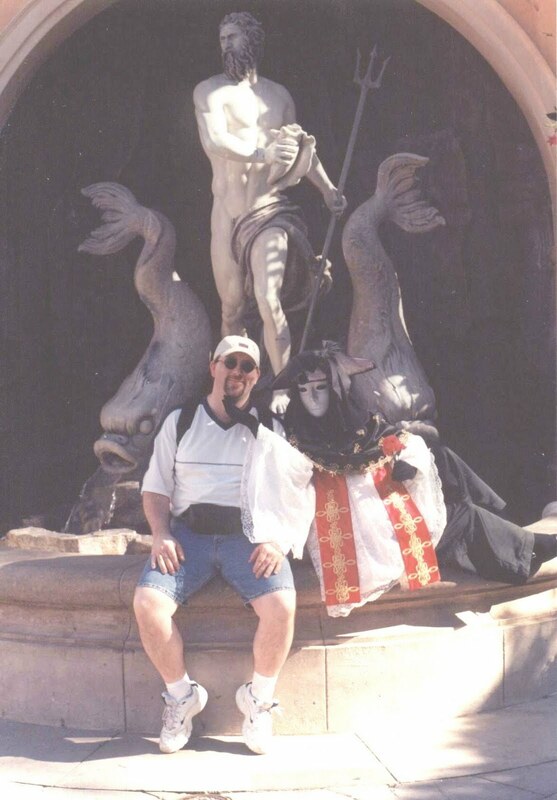 When we visited Italy in April 2001, a masked lady took a special liking to Bob. Spaceship Earth looks really close, doesn’t it? The next photograph shows a better representation of how far away Spaceship Earth was from Italy. From Italy we walked to Germany, the subject of my next blog post. Wonderful photos Linda. Looking forward to looking at all your others. What a lovely getaway you had. What an amazing place. I can see why you and Bob like it so well! All your pictures are just lovely! I have enjoyed seeing them all. Ooh! Did you take a gondola ride?? Too bad that dessert cart wasn't mobile – I LOVED IT! What amazing colors! Now that I no longer travel 😦 I enjoy your posts even more!